The term melee (rhymes with "jelly") is used by gem dealers and jewelers to refer to very small diamonds, usually those that weigh 0.18 carats or less. Diamond melee is used in jewelry as accent stones or in closely-packed clusters known as pave’. The size of small diamonds is often stated in points, where there are 100 points in 1 carat. Thus a 0.18 ct diamond is 18 points. Usually diamond melee is found in weights ranging from 1 point to 18 points, but diamonds can be cut even smaller, as small as .001 carats (a tenth of a point). A 1/2 point diamond is about 1 mm in diameter, while an 18 point diamond is about 3.7 mm. 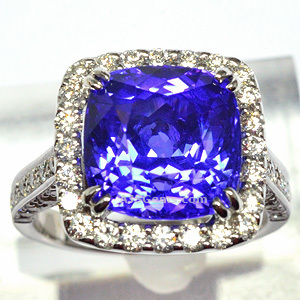 Though melee is small, the quality of the stones is subject to the same exacting standards as larger diamonds. Melee is graded by color and clarity on the same GIA scale, and cut and polish is equally important. Diamond melee can provide brilliant white points of light in jewelry designs, but the brilliance depends on quality. The reason that these tiny diamonds are so bright is that they receive the same precision brilliant cut of 57 or 58 facets as larger diamonds. Diamonds under 1 point may be given a "single cut" with 17 facets, to improve light performance since the facets are so small. It is indeed amazing that such tiny diamonds can be faceted. For a long time they were cut and polished by hand, but today modern technology is taking over. The vast majority of small diamonds are cut in India, mainly in Surat in Gujarat. 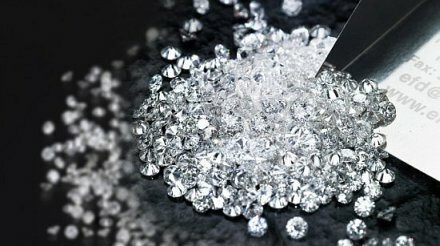 In fact 80% of the world's diamonds are polished in India, though only 55% by value, since more valuable diamonds are still cut in Antwerp and Tel Aviv.